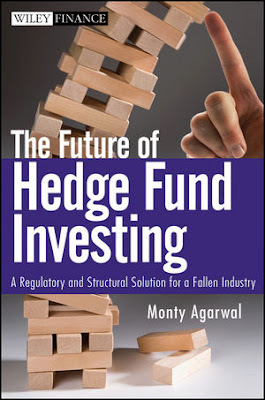 This book looks at the history of hedge funds, a brief look at some spectacular failures of hedge funds over the years, including the one run by Bernie Madoff, the types of hedge funds and their investing strategies, the fees and redemption structure, the skills required of a hedge fund manager, the due diligence expected of a hedge fund investor, what a fund-of-hedge-funds does, regulatory mechanisms in place, and a healthy dose of prescriptive remedies for the hedge fund industry. The book is written in a conversational style, contains no mathematical equations (save for one on the CAPM - the Capital Asset Pricing Model: E(Ra) = Rf + Beta(E(Rm) - Rf)), is short, and a very approachable primer to the world of hedge funds. It is not an investigative work, rather a descriptive one, that walks the reader through almost all aspects of a hedge fund - from the investors, the administrators, the managers, the regulators (or their lack thereof), and the markets. "As we take a look at the following scandals, we will see that blind greed, a herd mentality to belong to an exclusive club, and lack of proper due diligence has often led to financial ruin." - while Monty states this with reference to the uber-rich community of Palm Beach Island, the same could be said of the lesser rich too. More often, the need to conform and follow-the-herd takes precedence over exercising one's gray matter. "In the month of September 2006, Amaranth lost $6 billion or 65 percent of the fund's capital on a single natural gas trade." Why? How??? Simple - leverage. As When Genius Failed: The Rise and Fall of Long-Term Capital Management so eloquently describes, leverage was the tool used to multiply small returns into large profits. When it works it is spectacular. When it fails, it usually brings down entire companies, or as the financial sub-prime crisis demonstrated, entire economies can be brought to their knees through hyper-leveraged speculative frenzies. "Hedge fund strategies like relative value arbitrage, convertible and fixed-income arbitrage rely very heavily on the past relationships between various bonds and their derivative instruments to hold into the future. But, in 2008 these decade-long relationships broke down, and therefore the hedge fund strategies that relied on mean reversion of these relationships performed the worst." Two hedge fund failures - KL Financial and Amaranth Advisors - are described initially. The point being that while one failed because of outright fraud, and the other because of an overleveraged position gone horribly wrong, the other near-collapse was because of an un-diversified strategy that went wrong. The lesson is the same - investor greed. "The skill set requires a deep knowledge of the investment banking industry and a robust Rolodex of industry contacts." "Hedge funds, however, are not completely disconnected from the crisis. They have been blamed for violating short-selling rules and rumor mongering, as well as creating systemic risk due to their derivatives portfolios.... "
"This is clearly an area where the SEC needs to strengthen and enforce regulation. Capital markets will self-govern effectively as long as the rules of the game are being applied uniformly and followed diligently." Investor protection through government intervention or regulation is largely diminished in the world of hedge fund investing, except to the extent that the government mandates that only "accredited investors" and "qualified purchasers" are allowed to invest in hedge funds. Maybe the need is for tighter and more sweeping regulations; after all, over-regulation never caused a financial crisis. On the other hand, lack of adequate regulation has been a contributing factor behind almost every financial crisis in the last 100+ years. Disclosure: Monty is my brother, and to the extent that has biased my review, it is probably inevitable.